The brief for this campaign was simple and clear: raise awareness about dementia, a disease that isn’t well known by the majority of the Belgian society. Dementia is still far too often associated with older people, by patients and doctors alike. Young onset dementia affects around 6.000 people in Flanders. Unfortunately, as a result, when young and active people encounter the symptoms for the first time, they are too ashamed to go see a doctor. Research shows: it takes an average of no less than 4 years before patients receive the correct diagnosis. This means patients lose 4 years treating diseases they don’t have, instead of preparing for the journey ahead with Alzheimer’s. That’s why the Alzheimer League Flanders wanted to break the taboo of young onset dementia. The documentaries called upon other dementia patients to immortalize their dearest memories on ‘imstillhere.be’. A new platform where people can record messages and have them sent to their loved ones on a future date of their choice when dementia might have taken over and they may no longer be able to tell them themselves. In Belgium, most radio commercials are no longer than 30 seconds. But to create impact, and to tell a powerful story, you need more. So, we aired 90 seconds radio recordings. Right before the news bulletins to attract the attention of journalists. And it worked. It immediately became the most shared topic in Belgium and got picked up by radio, press and television. The winning formula of this campaign was: teamwork. Along with radio studio Raygun and production company Landvogel, we were able to create this beautiful piece of work. Special thanks to Liesbeth from Raygun for the impressive support. What a wonderful job she did. Not only did she give us all possible time in studio, she also helped to interview the dementia sufferers. The craftsmanship afterwards and the beautiful music – written by Peter Baert – made this campaign into pure and touching radio. Because at the end, this campaign was really sincere. When talking to people, affected by this terrible disease, we felt very small. It took us hours in the studio with these people. We smiled, laughed and cried. We gave those people a voice. And listened to their stories. Some of them were honest about their deepest feelings, their battles and even about euthanasia. The day we launched these radio-spots, we got overwhelmed by press. 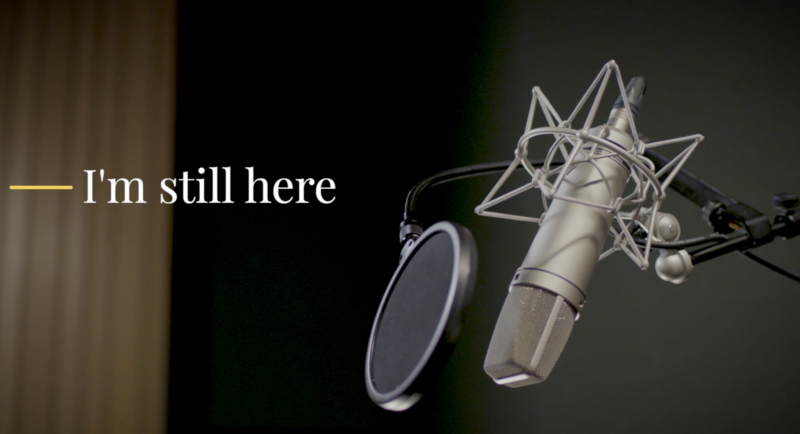 “I’m still here” put early-onset dementia on the public agenda. It got featured on the front pages of Belgium’s biggest newspapers and became prime time news on national television. This resulted in other radio stations airing the portraits as well and free media space in all Belgian cinema halls. Two days after the campaign, the biggest Belgian newspaper dedicated a full-page article with all the (readers’) letters they received about the campaign. I remember text messages of the dementia patients, telling me how touched they were with all positive reactions. They felt relieved people finally understood their battle. The whole week we kept in touch. They were so proud. Months later when this campaign won a Golden award at Eurobest, Patriek and Inge wrote to me on Facebook – they felt like real stars. And to be honest: they really are. THIS CAMPAIGN FEATURED AS LOVE CAMPAIGN: FIND OUT MORE!